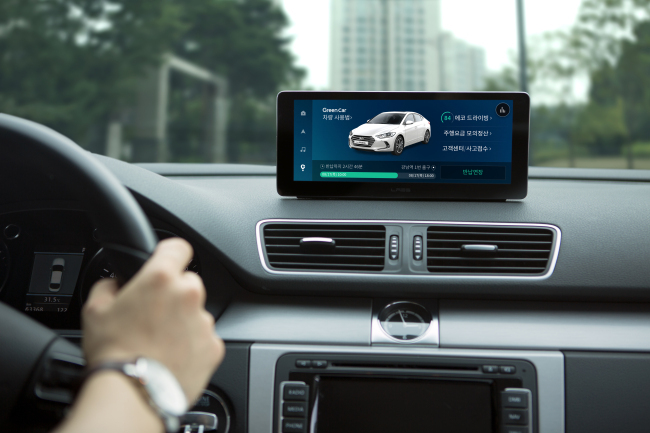 Naver Labs, the new technology research and development unit of South Korea internet giant Naver, on Thursday unveiled its in-vehicle infotainment platform Away, marking a new step forward for its connected car technology business. Naver plans to deploy its new infotainment platform and dependent display device in 1,000 vehicles operated by Lotte-owned car-sharing company Green Car by the end of this year, with aims to expand this number to 3,000 vehicles. In-vehicle infotainment refers to a collection of hardware and software in automobiles that deliver audio and video entertainment as well as information inside cars. It is viewed as an integral component of connected cars and autonomous cars set to shape future driving. Naver Labs’ IVI system Away combines “ambience intelligence” with “way” to denote a smart lifestyle solution for the road. The internet giant signed an agreement with Green Car to deploy its IVI platform in the partner’s car-sharing vehicles in April 2016. And the deployment has now begun. Naver has newly installed a 24:9 ratio “head-unit display” running on Away inside Green Car vehicles. Drivers can log in using their Naver account to stream personalized music and radio broadcasts from Naver Music player inside their cars. Drivers can also access driving routes set on their Naver Maps account and also search for nearby restaurants and stores via voice command. Naver said it has taken great care to prioritize the driver’s safety and convenience in designing its display device. To minimize disruption to the driver important information is shown in a “split view.” It also includes an array of features useful to car-sharing vehicles such as rental extensions and expected rental fee calculation. Looking ahead, Naver Labs plans to work with more partners to add diversify and expand the scope of its IVI system. In the future, Away may be able to process an event saved on the calendar to automatically make the due restaurant and parking reservations on its own, it said. “Green Car expects to offer drivers a more fun and convenient driving experience by adopting an artificially intelligent assistant system into its car-sharing vehicles,” said Green Car CEO Kim Jwa-il in a statement. Global internet giants have already launched similar IVI services linked to mobile platforms, including Google’s Android Auto and Apple's CarPlay for vehicles.